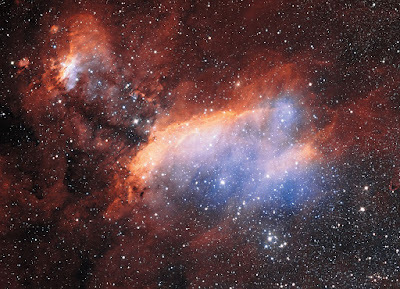 The fantastic new image of the Prawn Nebula containing clumps of hot new-born stars is one of the largest single images released by the European Southern Observatory (ESO) - and is the first of many likely to come from the VPHAS+ public survey of the entire southern plane of the Milky Way. This high-resolution digital survey is using the power of ESO's VLT Survey Telescope (VST) to search for new objects including young stars, planetary nebulae and distant, very luminous stars. The image was taken with ESO’s VLT Survey Telescope which is based in Chile as part of the VPHAS+ public survey led by Professor Janet Drew from the University of Hertfordshire’s Centre for Astrophysics Research (CAR). It testifies to the VST with its 32-CCD mosaic camera, OmegaCam, being the world's best optical imaging facility on the ground at this time. Located around 6000 light-years from Earth, the Prawn Nebula is around 250 light-years across, covering an area of sky equivalent to four times that of the full Moon. Despite this huge size it has not been a frequent target for observers due to its faintness and because most of its light is emitted at wavelengths where the human eye is not sensitive. The very sharp VST images taken in two broad red bands and narrowband H-alpha (a line of hydrogen that is very good at picking out hot ionized gas) were further enhanced to bring out the colour by including additional high quality imaging through a blue filter taken by Martin Pugh, a very skilled amateur astronomer observing from Australia using 32-centimetre and 13-centimetre telescopes. It is interesting to notice that Martin Pugh had to dedicate 8-9 hours of exposing time to just this one filter, whereas the VST total exposure time for all three filters was under ten minutes. Amateur astrophotographers are unsung heroes, and a 2.6-metre telescope on a good high site with active optics and a state-of-the-art camera is very efficient! These images and especially the photometric measurements derived from them, will provide a springboard to a better understanding of how stars evolve and of how the Milky Way’s stellar disc is organised. The data-gathering phase of the survey is unlikely to end before 2016, and taking the data is the easy bit!